Sales by wards provides another insight to the state of the District's housing market: while unit sales volume is higher YoY in every ward save Ward 5, average and median prices fell in at least half of the wards. 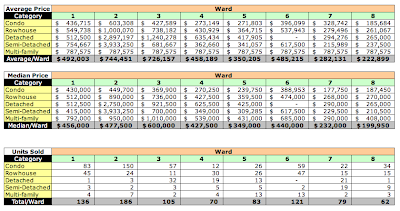 Looking at the data again, I find that 65% of all March condo sales in the District were recorded in Wards 1-3. Given that the distribution of home sales was roughly evenly distributed among the eight wards, it seems obvious that condo sales played a significant role in supporting the growth in average and median prices in Wards 1-3. Considering that my previous post showed aggregate sales volume grew 17.27% YoY, it seems rather ominous that half the District's wards are experiencing declining average and/or median prices. 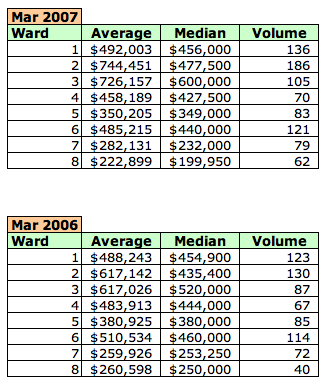 The following tables show the YoY aggregate sales data for each ward in March 2007. The following tables show the average and median prices and sale volume for each housing category in each ward in the District.